We spent the past two days on Cape Cod with our good friends Jack and Jean. Cape Cod, Massachusetts is a peninsula jutting into the Atlantic Ocean. It’s comprised of fifteen main towns encompassing many quaint New England villages and well-worth a visit if you’re ever on the northeast coast of the United States. I snapped some photos to share and decided to explain how I sometimes get the special effects some of you have asked me about. 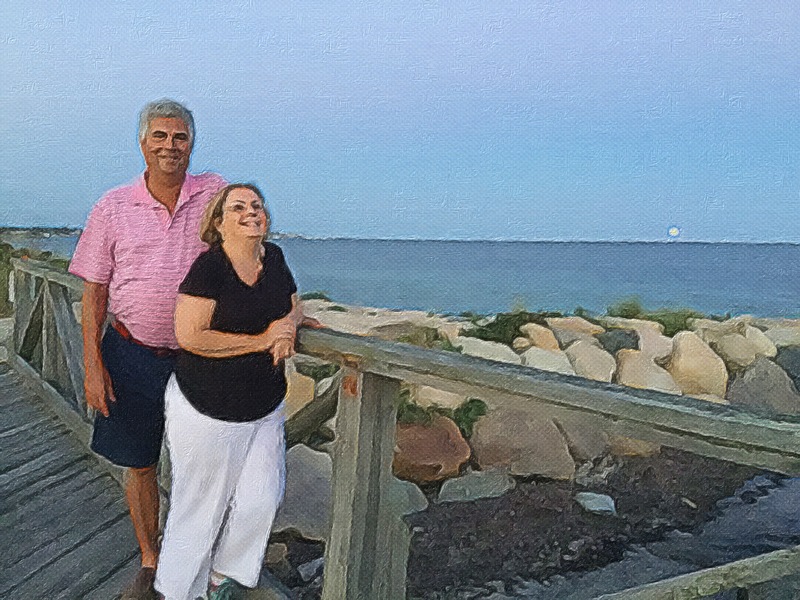 I use my iPad to take the photos and then run them through an APP called Brushstroke. Here are some originals and the apped pictures from our mini-vacation sailing on Vineyard Sound with our best buddies. Composition is important when you’re choosing photos to app, although you can crop and darken or lighten as needed even after the fact. In addition to scenic photography, people can be interesting subjects, too. There are many settings choices but I tend to favor Oil 1, Simple 5 or 6 and Gloss 2. Now, you can get a lot more creative with this app by choosing different settings. I’m not very artistic, but I use Brushstroke to do illustrations and create some really interesting pieces. I was showing this to two young girls on the boat and they couldn’t wait to try it out. It’s easy and there are many other Apps available, too. I actually picked this one up for free, used it and liked it. I hope this answers some of your questions, even though it probably has dispelled the myth of my incredible creativity you all had in your minds! Marriage can do that, too. Happy Anniversary and thanks for sharing the information on the app. I think I would rather like being called someone’s midlife crisis. Happy anniversary! Loved the photos! Thanks, Lorrie. I loved taking them. The weather at the Cape was lovely and being with good friends was just a joy! Congratulations, Clare! Here’s to many more! 🍾🍾🍾🎉🎉🎉 Hope there was some champagne to go with that chicken! Getting married for the first time at 51 is so daring! Even more daring than a red convertible. Older and bolder is the way to go. Congratulations to you both! I haven’t caught up with the use of ipads and apps, etc, so I’m fascinated by the effects you’re able to get. The “apped” pictures look so great! I wish you and Charley a happy 16th anniversary. Congratulations! The best marriages start in August (we celebrated two weeks ago)! Happy anniversary to you both, and may you enjoy many more to come! Thank you, peggy. It’s been a lovely day and I still have an piece of angel cake with chocolate frosting waiting for me. Yayyyyyyy! Hi, Peg, and thanks. We’re having cake in a few minutes! I love angel food cake with chocolate frosting! Yaaaaaayyyyy! Happy 16th Anniversary, Ethel!! Charley is one blessed man to have you!! And he cooks??? Does he have a single brother??? Thanks for telling your wedding story, how fun!! Hey, Lucy! He never cooked before he married me, so he had to learn or starve! And I hate to tell you this, but he cleans up and does the dishes! I’m not lying! Cooks, cleans, AND does dishes????? PLEASE tell me I can clone him!!!! You deserve all the best, my friend! I guess the trick was waiting 51 years or finding a guy whose first wife was so toxic, she made me look like God’s gift to men! Who knew? Lol, maybe that’s what’ll work for me!! I can hope!! You’re very welcome. Your meal sounds delicious! Lovely, lovely, love story. Congratulations to you both – so very deserving! Found this via purpleslob – happy anniversary and thanks for the app info – will take a look as it could save me all the time I spend messing around in Photoshop! Thanks. That’s exactly what motivated me to search out some Apps and I stumbled on this one. I’ve tried a few others, and i’m sure there are better ones, but Brushstroke serves me well. Have fun, Gilly! Happy anniversary. I love when a man takes time to cook such a special meal. Thanks for the app info. I will check it out. Wishing you both many more wonderful years. Thanks Clare. Its good to know you weathered life’s storms together. Sadly, I had a different experience and I did not expect to end up divorced but it was the best route for me. Charley was married for 25 years and then divorced. I had never married and loved being single. Life throws us curves and everyone has a different set of paths. We just have to decide which one is best for us. Yes. Life sure takes us to some unexpected places! More sailboats than ships – rather dependent on the prevailing winds of fate – yes, enough of that! I’m interested in everything, so, will follow the link to educate myself on Neoliberalism. I thank you for that and I reiterate that I’ll be returning to your post later. Hopefully, this article will help me in making any future “lucid” comments to be shared on your site. Many congratulations to you both, you make a lovely couple. Hello & happy anniversary. It was wonderful to read about your wedding. I agree that staying together through hard times is what makes a marriage. What a treasure you are for each other!! Happy Anniversary a day late but still very much heartfelt! Take care and enjoy many more, Clare! Nicely done my friend. Lovely to see you again. Sorry, been busy on my book. So great to see you so happy. I’m ready to give up and cry Uncle! I’m checking out a real printer. So, I did find you on google search and have been reading all of your lovely August posts. I still can’t get in through your links. Also, I’m having trouble getting a comment box after your post. Hmmmmmm? Sorry you’re having such trouble arriving. So glad you found a way. Such dedication. Thank you very much. That second one seems to work since WordPress got me signing in via WordPress instead of the simple url. ALSO: in the teen-tine type at the end of each blog, there is a wee “leave a comment” link. I am a very persistent woman! I’ll check all of these links, now, and see what works best! The first one works, the second one doesn’t. Now I’m off to your blog again to see about the comment link. Thank you for your many likes. It is so heart-warming when you learn that someone has appreciated your efforts. I need to steal a bit more time to peruse your scribbling further too. So far, I am liking what I see. Hey Claremary, I just tried the leave a comment thingy, and it opened a box in which to comment — on my site. Curious, eh? Yes, something is very strange in your set-up. What template are you using? I’m going to your blog, now to see what’s going on. It looks like if your remove the /blog and just have hwbrycewrites.com , followers can connect. I truly wanted to leave a comment under “You’re Doing Very Well As Far As I Can Tell” and I did find the “leave a comment” but no comment block ever comes up even though I’m logged in. Oh bless you Claremary. That is so warming. I gladly embrace your virtual hug. And yes, my writing has saved me, and not just virtually. I guess I should insert the whole form for the comment thingy to work. I’ll try that. Okay. I would have written more comments, but I just couldn’t get it to work.You’re welcome and we’ll get this thing to work for you. I’ll keep checking your blog posts and trying to comment. Usually when I check my comments and then tap on the picture or site given, I go right to that blogger’s posts. But, When I do that with your photo and hwbrycewrites.com/blog it sends me to a page saying” My Blog” “Nothing Found” and suggests I search. Get rid of the /blog and maybe it will help? Now I am going to the other link you gave me in a previous comment. I’m just getting messages that your blog is “not found”. I was sent to Google search by this latest link. ??????? Hey Claremary, where do I comment on your blog, to which I have just subscribed to follow. And hey! Thanks for your follow. Happy writing to you. At the bottom of my post are tags and categories and then the Likes and Comments follow underneath. I’m glad to have you as a visitor. You’ll spark things up a bit! Happy Anniversary (belated) and congratulations! I enjoyed your smile-inducing post. Congratulations you two! Wishing you both many more years of love and laughter together! Congratulations you two! Wishing you many more years of love and laughter together! That’s a wonderful prescription which I’ll make sure we follow to the letter. Thanks! Hi Claremary, — So sorry about the trouble with the comment thingy. Where did you first get to my blog hwbrycewrties.com? If somehow you got the hwbrycethewriter, then it’s no wonder we have trouble. That was my initial attempt at a web site. I thought that site was so old as to be extinct. Yes the /blog thingy was an old attempt to get to the blog not the static home page — and it has been a problem. But I don’t know how to fix it. Your old web site is still your url. It needs to be changed. Check to see your gravitar and make changes there. Thanks, Deb. This would be a great place to be as a teenager. We visit friends in Mashie and take adventures together. I did a previous post last year under the category Adventures with friends. Although June and July were pleasant, August has been really humid and so my gardens have suffered. I’ve been using that App for a few years and really like some of the settings. Others, I don’t bother with. Roxie got to stay home and babysit ZuZu. They don’t do well in cars. I think they feel they’re going to the vets and resort to caterwauling. So, no car rides for them! Happy belated 16th Anniversary you too!! Thank you, Dennis. We’ve decided to continue the celebration for the entire year! Thank you and yes, we do love to have fun. Charley says I make him laugh all the time. I tend toward the goofy lately – old age! The BBC World News was at a baseball game! And they didn’t notify me? What were they thinking? Who explained the rules to them and what was happening out on the field? I’ve been spending all my time with this mystery edit and so have not posted or visited – but I’m going to your site, now. I’m curious about your trip and the start of your new school session. One look from me would have said it all! And my adjectives to describe him could not have been aired on any channel! Lovely photos… of both then and now. Happy anniversary! Thanks for the insight into Brushstroke Clare. I have seen this type of image on Instagram with people using an APP called Prisma. I’ve not played with any of these types of apps but they look like a lot of fun. Gail, I love some of the Brushstroke settings, but I’m glad you mentioned Prisma. I’ve been meaning to check it out. Once you get the hang of the App, it’s lots of fun. Right now I’m taking photos of historical buildings in my town where the mystery is set and apping them for the book. That’s a good idea for your book Clare. I’m up late working on the photos as we speak! 16 Years and still growing strong. I only wish you both Very Good Health for many, many years to come. More happiness is in store. Happy anniversary! I like what you did to the pictures too! Thank you. It really is easy when you have the right App to created something very different from the original photo. It works on some and not so much on others. You just have to play around with it. Ohmygoodness I can’t believe they are taking the locks down down!!! When I was Iin Paris I found two bridges with locks, one was a sturdy bridge that looked rather new and the other looked like it was made of steel or something, so that’s probably the one being taken down. Sad day! It’s the original Bridge and the locks were weighing it down, so it must be replaced.I wrote about it in one of the Charley and Me posts with photos of me putting the lock on the fence and Charley throwing the key into the river. I guess we’ll just have to return to Paris and do it again. De rien!